I chuckled when reading up on the history of these Chinese crullers, you tiao (油条), which have been localized in Thailand into Pa Thong Ko (ปาท่องโก๋). According to the widely-circulated Chinese folk etymology, these pairs of dough sticks apparently represent two evil people who deserve to suffer in hot oil. To the Thai people, the conjoined crullers represent something cuter and more romantic: a couple who are deeply attached to one another and seen together all the time. Symbols and figures of speech behave like that across the various cultures. The Zealous Water Buffalo, my alter ego, has written about these things. Also, the Thai people like to eat these crullers with sweetened condensed milk, coffee, or dipping custard, Sangkhaya (สังขยา). They are also served with Chinese congee, jok (โจ๊ก). Note that there’s another kind of fried dough that is also called Pa Thong Ko, but it’s almost entirely different from what’s in view here. This type of Pa Thong Ko is smaller, fried until thoroughly crispy, and served as an accompaniment to Chinese-style soybean curd in warm ginger syrup (เต้าฮวยน้ำขิง). Enough with the background information. Let’s talk about how to make these crullers. First of all — and this may sound harsh — assuming my opinion means anything to you: if you see recipes for Pa Thong Ko that don’t call for both baking ammonia and alum powder, I wouldn’t even think about messing around with them. I’m serious. That’s the whole point of being a recipe tester: I waste my time and money, so you won’t have to. And, boy, did I do just that. With just baking powder, your Pa Thong Ko will be doughnut-like, and you and I both know Pa Thong Ko aren’t doughnut-like. With just baking soda, your Pa Thong Ko come out crusty (as opposed to crispy) on the outside and hollow on the inside. Again, we both know that doesn’t describe good Pa Thong Ko. My recipe takes no chances. It has ammonia, alum, and yeast. Baking powder is added at the last stage just before the dough is formed to give it a lift in the deep-fryer. The result is Pa Thong Ko with open crumb (but not hollow) and crispy exterior. When you bite into one, it collapses between your teeth. No bouncy resistance as is the case with yeast doughnuts. The ammonia also gives the crullers that familiar scent that’s just faint enough to be pleasantly reminiscent of Pa Thong Ko from the streets of Bangkok, but not so strong that it reminds you of … I’ll shut up now. I’ll admit, though, that even though this recipe represents my best attempt to date, I still won’t give it an A or an A+. Maybe a B+. I’m satisfied with the texture and flavor, but shaping the dough into pairs of Pa Thong Ko in a uniformed manner is still a struggle for me. This is because the dough is wet. It has to be wet; otherwise, you won’t get the open crumb. Adding more flour to the dough defeats this purpose. Keeping the flour at this amount presents a bit of a problem for an amateur Pa Thong Ko maker like me as the two pieces of dough tend to merge together a little too seamlessly. You see, well-formed pairs of Pa Thong Ko kind of have to remain visibly two separate entities conjoined in the middle. It’s going to take some practice. I don’t even try to come up with a more creative way of shaping Pa Thong Ko. Forget dragon-shaped Pa Thong Ko or dinosaur-shaped Pa Thong Ko; I have a hard enough time making the classic shape. The rest is pretty easy, actually. The recipe has produced very consistent results for me during the past several months of testing and retesting. Be sure to secure all the necessary ingredients. Alum powder is found either in the spice aisle or canning aisle. Ammonia powder is a little harder to find at a local supermarket, but you can find it online easily. Lastly, have some sweetened condensed milk around — like I need to tell you that — to dip these crullers in. I don’t care much for Pa Thong Ko dipped in Thai dipping custard (sangkhaya), but sweetened condensed milk — hohohohohoho. Add all the ingredients, except baking powder, into the bowl of an electric mixer attached with a dough hook; mix on medium-high for 8-10 minutes. The dough will be quite wet, and you may be tempted to add more flour to it. Don't. The moisture in the dough is what creates steam inside the crullers when they're in the hot oil. Besides, once the dough has rested, it becomes a bit firmer and more manageable. Put about 2 tablespoons of vegetable oil (additional to 1 tablespoon in the dough) into a separate bowl and rub the bottom of the bowl with it. With oiled hands, form the dough into a round ball as best as you can. If you can't turn it into a smooth ball, don't worry. It doesn't matter. Make sure the dough ball is covered with oil. Cover the bowl with a kitchen towel and let it rest for 4-5 hours. After 4-5 hours, you will see that dough has not risen much, if at all; no worries. Everything's fine. Take the dough out onto your kitchen counter which has been dusted with more flour. Spread it out with your hands. Sprinkle the baking powder all over the surface of the dough. Fold the dough in half over itself and push it slightly forward with the heels of your hands. Give the dough a quarter turn; repeat with the folding and stretching 3-4 more times. Once the baking powder has been incorporated into the dough, form the dough into a ball. Working with one half at a time (keep the other half covered), spread the dough out with your hands and pat it down until you get an 8x5-inch rectangle. Cut the rectangle in half lengthwise into 8 strips of equal size, then cut the 8 strips crosswise in half. Repeat the process with remaining dough. Heat some vegetable oil in a fryer, making sure the oil is at least 3 inches deep. While waiting for the oil to heat up, get a bowl of water and start making conjoined dough twins. You do that by rubbing some water in the middle of one piece of dough (covering about an inch) on top of another piece of dough and pressing the two together at the spot where the water is. Arrange them on a platter in a single layer. Repeat until you've run out of dough strips. Once the oil reaches 350 degrees F (if you don't have a thermometer, do a chopstick test by pressing the tip of a wooden chopstick against the bottom of the fryer. If you see bubbles, the oil is ready), gently lower the twins into it. Don't crowd the fryer. You don't want the oil temperature to drop too quickly, and you want to have enough room to flip the twins around. Flip the twins around (did I just repeat myself?) constantly (This is easy to do with a pair of wooden chopsticks.) until they have puffed up and become golden brown all over. Fish them out onto a paper towel-lined cookie sheet. Arrange them in a single layer. Consume when slightly warm. Serve with sweetened condensed milk or Thai dipping custard (sangkhaya). I didn’t know thais had their own version of you tiao! What a cute shape too! And am especially impressed and in awe that you made the dough from scratch. The aroma of deep fried dough is especially lovely when scattered over congee, and as it soaks up the liquid to become slightly crispy-soggy, ah yum! This is the most fascinating recipe EVER! Beautifully described and well written – one could actually follow it! Though, at 81, I think it is a trifle much for me to do, the cooking teacher in me is forever grateful for your sharing it with us! Never stop opening us up to new adventures. I have ammonia powder but am a little worried to use it as i found it in the cleaning products section of my local asian supermarket.It does have the familiar eaglobe logo which other asian food products like noodles come in and says packed by tat hui foods on the back.Im nearly 100% sure it the right stuff but would be really nice for someone to confirm.P.S I think your tod man pla dinosaur and penguin shapes beat the pa thong ko dragon and dinosaur! The difference between the various Tod Man Pla shapes and dragon-shaped PTK is that the former isn’t intentional whereas the latter is. But thank you! how very kind of you. I wouldn’t use that ammonia powder you have. Best to use the product specifically made for baking. Sorry i forgot to mention it has a printed label stuck to the bag that says in french chemical product do not swallow. I didn’t know you tiao travelled all the way from China to Thailand. How fascinating! When I lived in Shanghai, I loved eating you tiao with rice congee for breakfast. very well written. Pa tong ko is THE most favorite food all my life. There’s no chinese or Thai communities in this little city where I live. Now, I can make them myself!! Thanks to you. heaven when I can make these heavenly delicious fresh rice noodles!. Impressive effort. I love yau char gway dipped in congee Hong Kong style, but it sounds awesome with condensed milk too. Bee, that’s exactly the Chinese treat that the Thai people (back then) got confused with you char kway! I believed the Pak Tong Koh is what the Thais call Fried Sa La Pao. Street vendors normally sell them with Pa Thong Ko and they are sweet dough. At least that what I have read somewhere before that we confused the name of the two. After having read your post I clicked onto one of my other regular reads- Eating Asia- and they had posted a piece on these very same crullers in Chiang Mai. Spooky! Haha. No worries. That is a great post by Eating Asia. I want to try to make this but afraid it will fail miserably. After following your blog for a while, this is my very first comment. Thank you so much for posting this recipe. Pa Thong Ko was a favorite when I was in Bangkok. Now that I left Thailand, often miss it for my breakfast. With your recipe, I think I can make it myself. (not sure if I can get alum powder here though) Beautiful picture and informative post!! My wife and I made this recipe yesterday. We doubled it, because there was no way we could split the donuts between the two of us and be satisfied! The recipe is incredible! We tried a couple of other recipes before including David Thompson’s and this one is by far the closest to the real thing. Pretty easy, too. To keep the two pieces of dough from sticking together in the oil, we helped them along with a pair of chopsticks. It works. They look like chromosomes to me. Might be fun to cook for a science-themed party. I made this today. I know the ammonia smell is supposed to dissipate as it cooks but mine did not. What did I do wrong? You didn’t do anything wrong, but I suspect you may be extra sensitive to the smell of ammonia. I’d try one of these two things to get around the issue: 1. Let the dough rise in a container tightly covered with plastic wrap in the fridge overnight. The retardation method may help dissipate the ammonia better than the normal method of letting the dough rise in a warm place in less time. Be sure to let the dough come to room temp before proceeding. 2. Replace one teaspoon of ammonia with 1/2 teaspoon of ammonia and 1/2 teaspoon of baking soda. Personally, I’d try the first method first, and if it doesn’t work, then the second one. Thanks! I’ll try the overnight in the fridge method to see how it works out. I actually prefer this method when I make beignets. Thank you so much for posting this recipe. 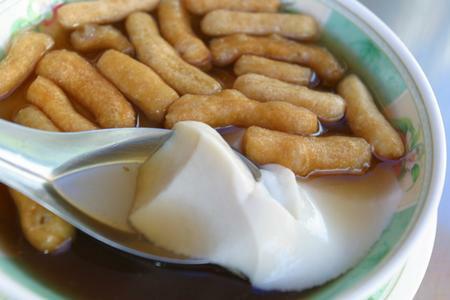 I’ve been looking for a slightly denser texture youtiao/gio chao quay and your recipe is very similar to what I’m looking for. The local supermarkets/bakeries in town sell the Chinese/Vietnamese version but the texture is lighter and airier than the version that my favorite Teochow/Cambodian/Vietnamese restaurant back home serves. The texture of these were perfect. I just couldn’t get past the ammonia flavor. It was worth driving to five different stores to find alum and ammonia powder. where I come from, this food calls chavkvai (I spell the way we pronounce it) or English calls Chinese cruller. Our patongo is the soft steam rice cake. Street vendors sell chavkvai and patongo together to complement each other taste. An again, when I make chavkvai I omit ammonia due to unpleasant smell and I also omit salt if I use rising flour. I use only baking powder and baking soda as rising agents to obtain the crispy texture and hollow chavkvai and it gives me the perfect result time after time. I was going to try this out making the dough tonight, but had a couple questions. Also, just wondering if the shape is more of an aesthetic/traditional thing? I assume it might not change the taste much if I don’t go through the bother of trying to make the traditional paired shape. Thanks for posting the recipe! Now, if I can perfect it before my parents return from Thailand.. Thank you. I’ve moved things around. It should be clearer now. Thanks! Taste came out nice, but clearly need more practice at kneading the dough. During step 6 of folding/stretching the dough a few times.. I guess I didn’t incorporate the dough into itself very well. When it fried, my unpaired pa thong ko started puffing out along the strata lines of the folded dough. Appreciate anyone’s comments on what else one should do to avoid this. FYI, I didn’t find the dough to be overly sticky at all upon first mix. Even almost too dry. I did try the overnight refrigerator rise, which may also dry out the dough more, which may have contributed to more of the stratifying of my folded dough. The dough is supposed to be sticky. It should be. The moisture is what creates steam during the frying which creates the honeycomb texture inside. If the dough isn’t sticky, reduce the flour a bit next time. I could be wrong, but you measured the flour by volume (cup) not by weight, correct? That can happen when you measure dry ingredients with a measuring cup. This could be the reason why the dough pieces had a hard time sticking and staying stuck to one another in the fryer. A trick I’ve recently learned in keeping the dough pairs from separating is to squeeze them lightly at the point they’re conjoined with a pair of wooden chopsticks. Release after 3-4 seconds. That helps them stay together. Yes, I did flour by volume. Between you and Alton Brown, I will have to revisit getting a good digital scale again. My last one just annoyed me by easily turning on by anything against it which drained the hard-to-change battery. I did not bother to even try pairing the pa thong ko as it was for a large party, and my first experiment with it. But will keep the chopstick trick in mind if I go more traditional =) Thanks again! i cannot find alum powder but i have found alum crystal in the baking isle. Is it possible to turn the alum crystals into powder through a mortar and pestle/food processor and still work with it? Jon – I think so.